What Is Modal and How Do You Wash Modal Clothes? What Is Modal Fabric and How Do You Wash Modal Clothes? The word "modal" started to appear as the fiber content listed on clothing and linens labels as the new material gained popularity. While the word might sound exotic, modal is actually just a type of rayon fabric that is made specifically from the fibers of the beech tree. The term rayon applies to fabric or fibers made of the wood pulp from any type of tree. Rayon is not usually considered a totally natural fiber because the wood pulp from the tree is heavily processed using a number of chemicals. However, the company that developed modal promises 95 percent of the production materials used to make modal are reclaimed helping to reduce emissions and conserve natural resources. Modal is classified as a bio-based textile and is a registered trademark of Lenzing AG, an Austrian company specializing in textiles and fibers. The concept of modal fibers was developed in Japan in 1951. Lenzing started selling its version of modal fibers commercially in 1964. Brand names include Lenzing Modal, China Modal, and Formatex. Lenzing has also developed MicroModal and MicroModal Air creating a lighter weight microfiber fabric from the beechwood fibers. Modal fabric can be a knit or a woven fabric. It is very soft, drapes well, resists creasing, and has a smooth lustrous finish. The fibers are often blended with cotton, spandex, wool, and other fibers because of its silky qualities. Because modal is both absorbent and air-permeable or breathable, it is cool to the touch. The fibers take and hold dye easily resulting in deep, brilliant colors and produce no dye bleeding during cleaning. Modal is 50 percent more resistant to shrinkage than cotton and tends to pill less as a result of the strength of the longer fibers and lower friction on the surface. 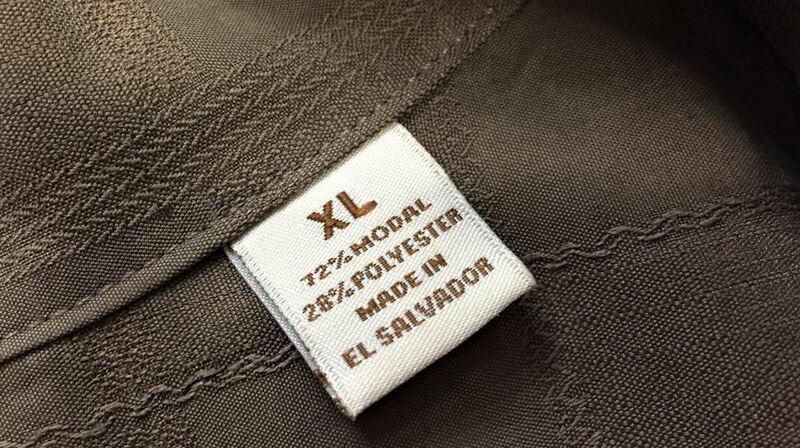 Unlike some rayon fabrics, modal will not become misshapen when washed due to the strength of the fibers. Modal is growing in popularity in the United States and can be found in activewear, underwear, shirts, towels, bed linens, and bathrobes. The items may be made from 100 percent pure modal or from fabrics made by blending modal fibers and other fibers like cotton or spandex. One hundred percent modal fabric should be cared for following the guidelines for cotton clothes and linens. Modal can be washed in any water temperature; however, you should always read and heed the care tag labels for your specific garment or accessory. There may be interfacings or decorations that require a specific cleaning temperature. You should avoid using full strength chlorine bleach because it may not only bleach out the color but will also weaken modal fibers. Dilute solutions can be used for stain removal and whitening of white modal clothes. However, even dilute solutions of chlorine bleach will weaken fibers causing them to rip and wear out if it is used too often. Instead, opt for an oxygen-based bleach (brand names are: OxiClean, Nellie's All Natural Oxygen Brightener, or OXO Brite). Mix a solution of the powdered oxygen bleach and water following the package directions and allow the stained modal garment to soak for at least two hours or overnight to remove most types of stains and to whiten or brighten. Modal should be dried on a low to medium-high temperature and taken from the clothes dryer while slightly damp to reduce wrinkling. Knitted modal fabrics are resistant to wrinkling if removed from the dryer immediately and folded or hung. Woven modal fabrics, like cotton, most often need a bit of ironing to look crisp. For modal fabric blends, such as silk/modal or wool/modal, follow the care instructions for the most delicate fibers in the blend. Some modal garments, depending on how they are woven and constructed, may wrinkle excessively when washed and will require ironing. Use a medium hot iron and always iron on the wrong side of the fabric to prevent creating a shine on the fabric. For extra protection, use a pressing cloth between the iron and the modal fabric. Extremely high temperatures when ironing can scorch cellulosic or plant fibers. The scorching or yellowing occurs as the fibers begin to burn. You may be able to remove light scorching but burned modal fibers cannot be revived.